Only a few more REMOVED teasers left and then I give you a week of RELEASED teasers before REUNITED teasers! It’s fun having so many books in the series now. I hope you’ve enjoyed the re-release of each of these books with their new look & feel, blurbs, and covers. For today, I give you the climax of REMOVED. It takes place at a taiko drumming concert where Sanaa is put on full display for all her enemies to see her. She’s nervous. She’s in danger. And then, something unexpected happens. The drumming is explosive, and the vibrations are coming straight up through the floor of our box to my feet. Besides the four drummers up front slamming on the largest drums, women in kimono stand behind them, their hands and arms a blur as they bang away on the smaller instruments. A young girl, not more than fourteen, plays the flute to the right, and I love her. She is so fast and sure. It’s immensely loud, but I don’t mind. The noise drowns out the thoughts swirling in my head, and the rhythm is actually quite peaceful. 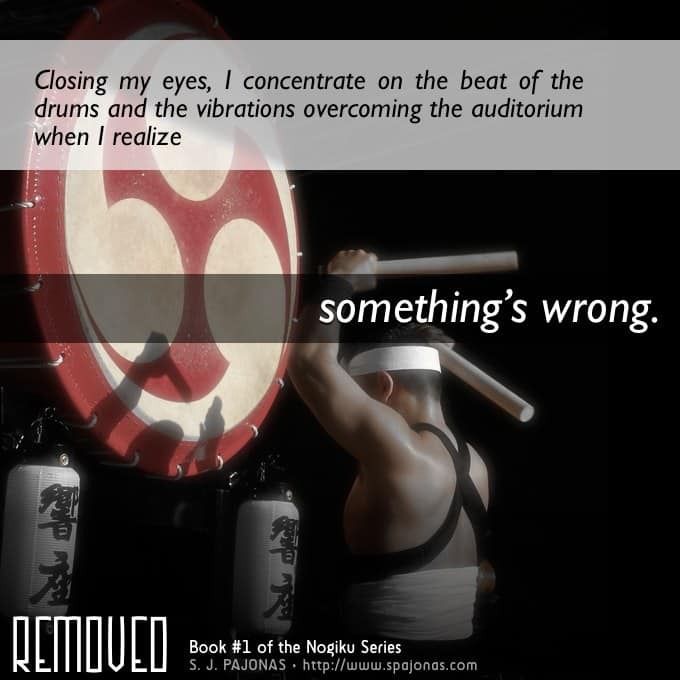 Closing my eyes, I concentrate on the beat of the drums and the vibrations overcoming the auditorium when I realize something’s wrong. I realize it at the same time half the audience realizes it, their heads swiveling to the ceiling. Available on Amazon, iBooks, Nook, Kobo, Google Play, and Direct!